I've spent every summer of my life (except one in Utah and half of one in Paris) in Arizona. Let me tell you, summer here isn't about running around enjoying the weather and all the beautiful outdoor furniture Pottery Barn keeps emailing me. It's about surviving. And swimming. This is the first Arizona summer I've enjoyed "pregnant" (29 weeks today!) so I've really been trying to avoid the heat as much as possible. This month's Pies with That challenge is to create a pie that means summer to you. While it is blistering hot and I'm aching for a nice February day, I've always loved living here and I'm more than willing to put up with the heat. I've been thinking a lot lately, too, that since I love my September birthday, I have to pay for it for my own daughter. So there you have it. I'm resorting to turning on every fan in the house, drinking tons of ice cold water, and eating lots of frozen dessert to get through these last seventy something days. I thought Dorie's Florida Pie was the perfect rendition of summer for me because it's refreshingly light and cool, only takes a couple of minutes in the oven (10 for the crust, which you could buy theoretically but I wouldn't recommend, especially since you can pile the crumbs high for a beautiful crust no problem, and 12 for the filling), and it includes coconut, which has always reminded me of sunblock. I know it's supposed to be the other way around, but I can't hardly smell coconut flavoring without picturing a public pool. Between that and the texture issue, I left it out. I needed this cooling, summer refreshment sans banana boat. Top it with shredded coconut if you're feeling daring. Keep this pie in the freezer for an extra refreshing treat, or let it soften for a few minutes if you're enjoying one of those Pottery Barn type summers I've read about. I love love love key lime pie. Nice! Ive never tried key lime pie before! I love lime though, so I am sure I would adore it! Yours looks great! I'm originally from Florida and key lime pie and summer are synonymous. I'm so glad you liked it and it helped you "feel" cool. Your son sounds (and looks!) so cute! I haven't tried key lime pie before but it sounds really good. your son is a cutie!! Mmm, I just recently made a lime tart and also turned the filling into a yummy ice cream! Looks great. It's a perfect summer pie! Key lime pie is wonderful! I am going to give your recipe a whirl. Yummy. This key lime pie looks fantastic. And your son is adorable!!! Love key lime pie and yours looks perfect! The smell of coconuts used to remind of suntan lotion. But now that I've been using it more in baking, it just reminds me of food. 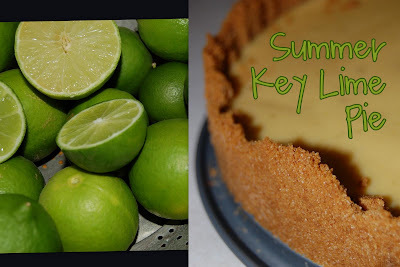 :) Your key lime pie is perfect way to stay cool in the summer heat. I made a key lime pie too- perfect summer pie! Yours looks great! Mmmm, I loved the Florida pie. Great pick for a summer pie. 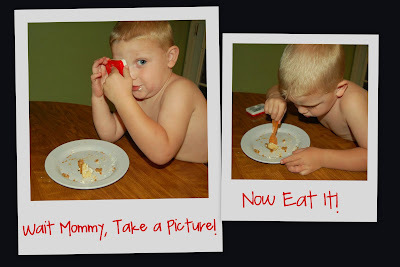 It looks delish and your little pumpkin is just too cute! I would definitely leave out the coconut. Sounds great to me! I was in arizona in November once and I thought that was too hot! I can only imagine how you must feel.